LONDON, May 1, 2008 (AFP) - Avram Grant let his emotions hang out as he insisted the critics should get off his back after Chelsea booked a first Champions League final appearance. Grant's side beat Liverpool 3-2 after extra-time in Wednesday's semi-final second leg at Stamford Bridge to set up an all-English showdown with Manchester United in Moscow on May 21. It was an emotional victory for Grant for a variety of reasons. A place in the final of Europe's elite club competition gives him vindication and the respect he felt he always deserved after replacing Jose Mourinho in September. But, while the final whistle brought joy for Grant, it was also tinged with sadness. The Israeli revealed after the match that he planned to travel to Auschwitz on Thursday to give a speech to commemorate Holocaust Memorial Day. "Since day one there have been so many microscopes on me. I understand the criticism before I took over but not after. I have needed to prove more than others," Grant said. "I respect the past but I work for the future and present. We play good football at the right time. It is not easy to play three games like these in eight days and with extra-time as well because Liverpool were rested. "This was a special day for me. Hard but very special. This is Holocaust day in my country and I will be making a visit to Auschwitz on Thursday. "My father buried my grandfather with his own hands, as well as his mother and his sister, but he always looked to the future, so this day always has an extra significance. "He was the most optimistic and strong person I have ever known, so to reach the Champions League Final today of all days was unbelievable." While the suspicion remains that Grant has been extremely fortunate to inherit a squad packed with world-class players who refuse to accept defeat, no-one can question his record so far. In reaching the final he has achieved something even his lauded predecessor Jose Mourinho couldn't manage at Chelsea. The Blues had stumbled three times previously at this stage, twice against Liverpool during Mourinho's reign. Now Grant wants his players to make more history by pipping United to the Premier League title before beating them in Moscow's Luzhniki Stadium. "We have created history. That is very important but we are still fighting for the title," he said. "It is strange to have two English teams in Moscow. It could be a great final. We have played all the important games better than the other matches; against Arsenal, Man Utd and Liverpool." When Liverpool manager Rafa Benitez reflects on what went wrong he should look no further than his own mirror. Benitez's withering pre-match criticism of Didier Drogba's occasional theatrics came back to haunt him in a big way as the Ivorian scored twice to cap a dynamic display. Drogba, who pinned a picture of Benitez next to his peg in the dressing-room, scored the opener in the 33rd minute before Fernando Torres equalised after half-time to send the tie to extra-time. Frank Lampard's 98th minute penalty after Sami Hyypia fouled Michael Ballack restored Chelsea's lead and ensured there wasn't a dry eye in the stadium as the England midfielder celebrated his first goal since the death of his mother last week. Then Drogba added a third goal seven minutes later with a close range finish from Nicolas Anelka's cross. Ryan Babel's late strike gave Liverpool brief hope of another European miracle but this time it was beyond them. 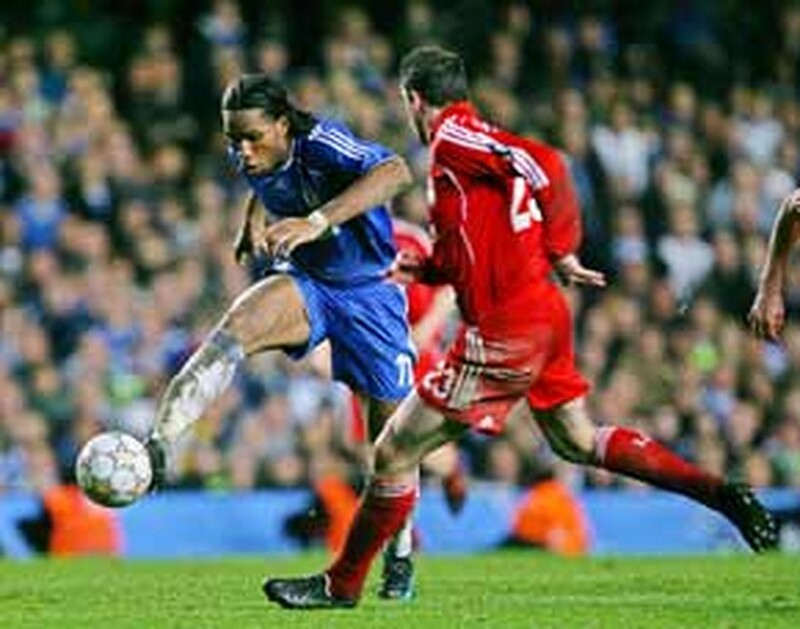 Drogba admitted Benitez's comments had given him an extra incentive to play a match-winning role. "Benitez is a fantastic coach and I was a bit disappointed but I think he felt his team was not strong enough and Chelsea were going to beat them," he said. "The scouting department is working. We must win our last two games then try to improve the squad," he said. "You never know. Sometimes one player can make a massive difference, like Torres, or sometimes you need three or four."